Reference number for this case: 25-oct-54-Les-Jonquerets-de-Livet. Thank you for including this reference number in any correspondence with me regarding this case. Since the flying saucers furrow the sky of France, no precise information on their subject was collected in the area of Bernay. Mr. Gilbert Haye, living in Les Jonquerets-de-Livet, had the chance, him, to contemplate a cigar, Tuesday evening, in a pasture which he exploits within 150 meters approximately of his home, along the road which goes from Jonquerets to Bernay. It was 7:30 p.m. approximately. Close to his garage, Mr. Haye was picking up pears when suddenly, he saw in the pasture, a green gleam and a red gleam; the green gleam seemed to launch rays comparable to small wires; the red gleam, although intense, did not radiate. A black and oblong body joined the two lights together. The object seemed to be two meters long and to have a height of 1 meter above ground-level. Each light was round, of a diameter of 20 cm approximately. The object advanced slowly and stopped near the fence of barbed wire which separates the pasture from the court positioned in front of the house. Mr. Haye returned inside his homea little frightened. The desire however tortured him to go to on the spot to see what was going on, but he did not have a lamp to light him and did not care much for walkin in the night, near the mysterious machine. At approximately 11 p.m., his son-in-law, René Marais, 23, arrived on motorbike, in company of a comrade, Jean Chéradame, 23. The adventure was told to them; then Chéradame prepared to go, climbed on his motorbike and moved away. Hardly did he drive 100 meters on the road that his engine was blocked suddenly: the young man fell down. The motor bike having undergone two damages, he brought it back to the Haye house to repair it. One lit the external light to give lighting to him. The two young people saw at this time two forms high of 1.20 meters approximately and dressed in body that shone in the light. They advanced in a slow and jerked way. René hastened to go get his rifle, but his parents had turned the light off and he did not see anything any more. Jean Chéradame took again his motorbike: it was 11 p.m. approximately. The two gleams reappeared, then rose quickly. When Chéradame passed on the road, he noticed that the oxen, in the pasture, were grouped and turned as [?] when they are intrigued by an object. Such is the account that Mr. Haye gave us, who seems in good faith. The author notes that on October 27, 1954 in the Eure, "Marsh. Motorbike. Craft with dazzling light in meadow and small pilots. Engine stoppe short." The source is noted as "FS for Oct. 30, 1954"
The authors say a landing in a farm area took place on the night of October 27, during the 1954 flap, in Les Jonquerets-de-Livet (Eure) in France. A farmer saw an elongated object with a light on each end which landed in a pasture. He was too frightened to investigate. Two hours later a motorcycle stalled and its rider fell from the machine. The farmer had notified residents of the- village, who went to investigate, found the object had moved somewhat, according to the farmer's estimate of where it first landed. Upon approaching the thing, the witnesses saw two beings about forty inches tall walking stiffly about in silvery clothing. The craft eventually took off without noise. Oct. 27, 1954, 07:30 P.M., Les-Jonquerets-de-Livet (France). A farmer, Gilbert Hee, was gathering pears when he suddenly saw an elongated object with a light at both ends resting in the pasture. He dared not investigate, but he saw cows gathering around the object. A minute later, the lights went out, and the witness lost interest and went home. Two hours later, an 18-year-old man named Cheradame fell from his motorcycle as it suddenly failed at the same spot, and alerted neighbors saw the object again. It had moved only slightly and two occupants were seen. They were about 1 m tall, walked in stiff fashion, and had clothes resembling bright armor. They vanished suddenly, and the craft took off without noise. (Personal). A farmer, Gilbert Hee, was busy picking pears when he suddenly saw an elongated object with a light at each end, stationed in a field. He did not dare to look closely at the object but saw the cows gather around the machine. A minute later, the lights went out and the witness, uninterested, went home. Two hours later, a young eighteen-year-old man, M. Cheradame, fell from his motorcycle, which abruptly pitched in the same spot. He alerted neighbors who saw the craft again. It had moved very slightly and two occupants were seen. They were about 1 meter tall, they were walking stiffly and their clothes looked like heavy armor. They disappeared suddendly and the apparatus took off noiselessly. (Personal). The two authors indicate that in Les Jonquerets-de-Livet in the Eure, on October 27, 1954, according to the Vallée catalogue, n° 317, L.D.L.N. of January 1970, a farmer, Mr. Gilbert Hée, saw a lengthened object, with a light at each end, posed in a meadow. Mr. Hée did not dare to advance, whereas his cows went near without appearing to be inconvenienced. One minute later, the lights went out. Not very curious, the farmer returned home. The two authors indicate that in Les Jonquerets-de-Livet in the Eure, on October 27, 1954, two hours after the observation of Gilbert Hée, a motorcyclist, Mr. Cheradame, passing on the road, at the level of the meadow, made a fall, its motor bike having suddenly stalled, and saw the same craft. He alerted the neighbors. The witnesses could see two beings of a size of approximately one meter, walking in a "stiff and mechanical" manner. Their clothing resembled "shining armours." They disappeared suddenly. A few seconds later, the machine took off without noise. 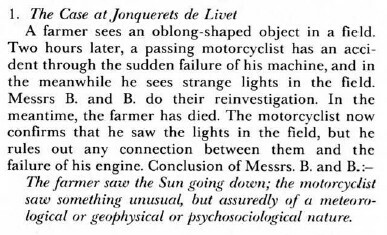 The ufologist indicates that on October 27, 1954 at 2130 in France in Les-Jonquerets-de-Livet, "A motorcycle failed at the spot where a UFO was previously seen two hours before by a farmer. Some men from a nearby village went to investigate and saw an elongated object on the ground. Two small humanoids about one meter in height were near the object, wearing armortype clothes and walking stiffly. They vanished suddenly and the UFO took off noiselessly. (Passport to Magonia, Vallee)". Among those cases, he indicates that on October 24, 1954, at Les-Jonquerets-de-Livet, Eure, France, a farmer witnessed an elongated object which had landed in a pasture. He chose not to investigate the landed craft. Two hours later, a youth fell from his motorcycle when it suddenly stalled on a nearby road, and the men in the village then took flashlights and went to the pasture to investigate. Then then observed that the elongated craft had moved a little distance. Two of the men dared go closer and they saw two little humanoids in bright clothing. The craft and creatures departed immediately. "... this luminous thing could not relate to a silhouette... no detail was visible... vague... without shape..."
They indicate that the witness told them that he did not see a relationship between the sudden stop of his motorbike and what he had seen, and they conclude that the case could be a hoax or a confusion or a natural phenomenon and does not have any relationship with the extraterrestrials. The two authors indicate that in Jonquerets de Livet in the Eure on October 27, 1954, there was an observation in two parts by two different witnesses and at one hour interval. At 07:30 p.m., a first witness, Gilbert Hée, was picking up pears, when he suddenly saw a lengthened object with a light at each end which stationed in a field. He did not dare to examine this apparatus closely. One minute later, the lights at each end of the object went out, and the witness returned home. He has noted that the cows being in the meadow had gathered around the apparatus. One hour later, at approximately 08:30p.m., another witness passing on the road, at the proximity of the meadow, fell off his motor bike, because it had suddenly stalled; he saw the same apparatus and alerted neighbors who managed to see the apparatus and two beings of an height of one meter twenty, walking in a mechanical manner. Their clothing resembled brilliant armors. A few seconds later the machine took off without noise. The authors indicate that their sources are the Vallée catalogue, and the books by Michel Carrouges and Garreau and Lavier. The two authors provide the summary by Jacques Vallée and note that he probably did not make an investigation although he says that his source is "personal." They indicates that Gilbert Hée is deceased, but that they had "another testimony which differs" in which it is an elongated object, lit at each end and which changed into a large sphere like the setting sun very far and very low on the horizon. This other witness does not remember the direction anymore and thinks that the observation was a little earlier, and the two authors conclude from that, that Mr. Hée had observed the setting sun at 05:38 p.m.. In an extract of his Francat catalogue, Michel Figuet recorded that the case was a confusion according to Barthel and Brucker, pages 56 and 57. Two hours later and at the same place as case N°6 [see the main page of my 1954 section, for the same date and place], the witness falls from his motorbike which has just suddenly stalled. He sees, him too, the apparatus, he alerts neighbors, and together they see two one meter tall approximately occupants, dressed with a sort of shiny armour and advancing in a stiff manner. The two characters vanish suddenly and the apparatus disappears. The farmer saw the Sun going down; the motorcyclist saw something unusual but assuredly (if a meteorological or geophysical or psychosocial nature. What makes the next case stand out is its apparent duration. Working in his pear orchard farmer Gilbert Hee saw a strange cigar-shaped object in a nearby pasture. At either end of the object were lights but nothing that was intimidating, nonetheless M. Hee hetitated to investigate although some of his cows had congregated at the spot out of bovine curiosity. The lights on the thing were suddenly extinguished for some reason so M. Hee returned to his farmhouse. The pasture where the object rested, it seems, was next to a road where some two hours later a young motorcyclist, M. Cheradame, lost control of his machine and took a bad tumble. Details are lacking but evidently the 18-year-old saw the UFO and blamed it for the lost of power in his cycle, in any event, he gave the alarm and some local people went to the pasture to check things out. An elongated object was spotted resting in a grassy area and nearby 3.5 foot tall figures in "bright armour" were seen moving about in a "stiff" manner. Perhaps due to the approach of the witnesses, the figures disappeared and the UFO soundlessly became airborne. 219. 219. Rogerson, Peter. "The Catalogue." MUFOB New Series 4. Autumn 1976. #38. p.7. The authors indicate that on October 27, 1954, in Les Jonquets-de-Livet, France, a farmer watched a cigar-shaped object with lights on both ends as it landed in a nearby field. He did not investigate then, but later, with a group of people, he sighted the object again. The witnesses saw two small creatures in silver suits near the object; which later took off silently. 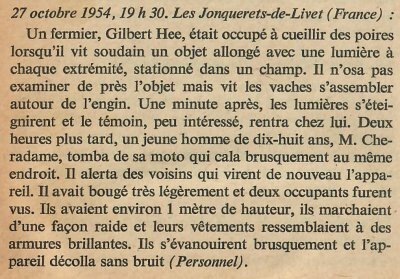 The Belgian ufologist indicates that in 1954, on October 27, in France, in Les Jonquerets de Livet "Gilbert Hee, busy picking up pears towards 19:30, suddenly saw a lengthened object with a light at each end stationed in a field. He did not dare to examine it closely. The cows were gathered around the object. One minute after the lights died out and the not very interested farmer, returned home. Two hours later Mr. Cheradame fell from his motor bike which stalled suddenly at the same place. He alerted the neighbors who again saw the apparatus which had slightly moved. Two occupants were seen. They were 1 m tall and walked in a stiff manner. Their clothing resembled shiny armors. They disappeared suddenly and the apparatus took off without noise." The source is indicated as "Jacques Vallée: 'Chronique des apparitions ET' - DENoeL 1972 - J'AI LU COLL. - p. 290". 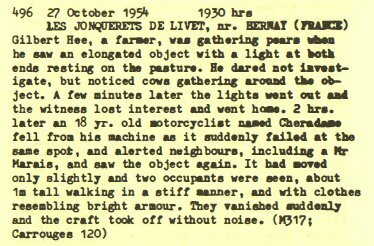 Donald Johnson indicates that on October 27, 1954, at 07:30 p.m., farmer Gilbert Hee saw cows gathering around an elongated object with lights at both ends, resting in his pasture in Les Jonquerets-de-Livet, France. Two hours later an 18-year-old man fell from his motorcycle as it suddenly failed at the same spot; the object had moved only slightly. Hee and his neighbors saw the object and two occupants, who were about three feet tall, walked stiffly, and had clothes resembling bright armor. They vanished suddenly and the craft took off without making a sound. Donald Johnson indicates that the sources are Jacques Vallee, Passport to Magonia: A Century of Landings, case 317; David F. Webb and Ted Bloecher, HUMCAT: Catalogue of Humanoid Reports, case 1954-120, citing Vallee. Two 18-year old farm workers, Jean Cheradame and Rene Marais, encountered a bright light source on a field. As they approached the light, two featureless illuminated human forms emerged from the light source. They lacked both arms and legs, and essentially resembled "white plastic bags" lit from within. They emerged from the light source in the field and separated into two distinct forms as they approached; when they receded they again merged into one form before merging with the light source. They were about five feet tall. Farmer Gilbert Hee saw cows gathering about an elongated object with lights at both ends, resting in his pasture. 2 hours later an 18-year-old man fell from his motorcycle as it suddenly failed at the same spot; the object had moved only slightly. Hee and his neighbors saw the object and 2 occupants, who were about 3 ft tall, walked stiffly, and had clothes resembling bright armor. They vanished suddenly, and the craft took off without noise. 07:30 p.m.: In Jonquerets-of-Livet (France), 1 farmer, Gilbert Hee, picks up pears when he suddenly sees 1 lengthened object with a light at each end, stationed in a field. He does not dare to examine the object closely but sees the cows gather around the apparatus. 1 mn after, the lights die out and the witness, not very interested, returns home. 2 hs. later, a young man (18), Mr. Cheradame, falls from his motorbike which stalls suddenly at the same place. He alerts neighbors who see the apparatus again. It moved very slightly and 2 occupants are seen. They are approximately 1 m tall, walked in a stiff manner and their clothing resembles brilliant armors. They disappear suddenly and the apparatus takes off without noise. "1st observation: The witness is busy picking up pears when he suddenly sees a lengthened object with a light at each end which stations in a field. He does not dare to examine closely this apparatus. One minute later, the lights being at each end die out, the witness returns home. The witness observes nevertheless that the cows being in the meadow had gathered around the craft." "2nd observation: One hour later towards 20:30, a witness passing on the road, at the level of the meadow, falls from his motor bike, having suddenly stalled; he sees the machine and alerts the neighbors who can see the apparatus and two beings one meter twenty high walking in a mechanical manner. Their clothing resembled shining armors. A few seconds later the craft takes off without noise." The website indicates that on 27 October 1954 at 19:30 in Les-Jonquerets-De-Livet, France, "Teen fell from motorcycle when engine failed suddenly, saw cigar in pasture, two occupants 1m tall, walked stiffly, bright shiny clothes, vanished suddenly, craft took off, no noise. An object was observed. Electromagnetic effects were noted. Multiple independent witnesses." And: "One cigar-shaped object was observed by one male witness on a farm for 120 minutes (Cheradame; Hee, Gilbert; Marais). No sound was heard. Two dwarves, each wearing a shiny metallic suit, were seen." The sources are noted as Bowen, Charles, The Humanoids: FSR Special Edition No. 1, FSR, London, 1966 Pereira, Jader U., Les Extra-Terrestres, Phenomenes Spatiaux, Paris, 1974; Vallee, Jacques, A Century of Landings (N = 923), (in JVallee04), Chicago, 1969; Schoenherr, Luis, Computerized Catalog (N = 3173); Carrouges, Michel, Les Apparitions de Martiens, Fayard, Paris, 1963; Delaire, J. Bernard, UFO Register Volume 7 (1976), Data Research, Oxford, 1976; Falla, Geoffrey, Vehicle Interference Project, BUFORA, London, 1979. The website indicates that on 27 October 1954 at 19:30 in Les-Jonquerets-de-Livet, France "A farmer, Gilbert Hee, was gathering pears when he suddenly saw an elongated object with a light at both ends resting in the pasture. He dared not investigate, but he saw cows gathering around the object. A minute later, the lights went out, and the witness lost interest and went home. Two hours later, an 18-year-old man named Cheradame fell from his motorcycle as it suddenly failed at the same spot, and alerted neighbors saw the object again. It had moved only slightly and two occupants were seen. They were about one meter tall, walked in stiff fashion, and had clothes resembling bright armor. They vanished suddenly, and the craft took off without noise." And: "An object was observed. Electromagnetic effects were noted. Multiple independent witnesses." And: "One ball was observed by two male witnesses, typical age 18, on a farm for 120 minutes (Cheradame). No sound was heard. Two apparitions, each wearing a shiny metallic suit, were seen." The website indicates that on 25 October 1954 at 19:30 in Les-Jonquerets-De-Livet, France "An object was observed. Electromagnetic effects were noted. Multiple independent witnesses." And: "One cigar-shaped object was observed by two male witnesses, typical age 18, on a farm for 120 minutes. No sound was heard. Two apparitions, each wearing a shiny metallic suit, were seen." The sources are indicated as Webb, David, HUMCAT: Catalogue of Humanoid Reports; Lorenzen, Coral E., Flying Saucer Occupants, Signet T3205, New York, 1967; Lorenzen, Coral E., Encounters with UFO Occupants, Berkley Medallion, New York, 1976, ISBN:425-03093-8 Vallee, Jacques, A Century of Landings (N = 923), (in JVallee04), Chicago, 1969 Schoenherr, Luis, Computerized Catalog (N = 3173) Rodeghier, Mark, UFO Reports Involving Vehicle Interference, CUFOS, Chicago, 1981; Hatch, Larry, *U* computer database, Author, Redwood City, 2002. A farmer, Gilbert Hee was gathering pears when he suddenly saw an elongated object with a light at both ends, resting in the pasture. He dared not investigate but saw cows gathering around it. A few minutes later, the lights went out, and Hee lost interest and went home.Two hours later, 18 year old Mr Cheradame fell from his motorcycle as it abruptly failed at the same spot, and altered neighbours, including Mr Marais, who saw the object again. It moved only slightly and two occupants were seen. They were about 1m tall, walked in a stiff fashion and had clothes like bright armor. They vanished suddenly as the craft took off without noise. The author indicates that there was a case in Les Jonquerets-in-Livet, in the Eure, on October 25, 1954, at 07:30 p.m. then 10:30 p.m. for the CE3, at 11:00 p.m. He indicates that the witnesses are Gilbert Haye or Hée, then René Marais, 22, and Jean Chéradame, 18. At approximately 7:30 p.m. close to his garage, Mr. Haye picks up pears when he sees suddenly in the pasture that he exploits within 150 meters approximately his home, a green gleam and a red gleam; the green gleam seems to launch rays comparable to small wire; the red gleam, although intense, does not radiate. A black and lengthened body joins together the two lights of the objet which seems to be two meters long and to have a height of one meter above ground-level. Each light is round, of a diameter of twenty centimetres approximately. The object advances slowly and stops near the fence in barbed wire which closes the court in front of the house. Everything dies out at this time. A little frightened, Mr. Haye returns home. At about 10 p.m., Mr. Chéradame brings back Mr. Marais by motorcycle to his home at Mr. Hayes', father-in-law of Mr. Marais. The two young people are friends who return from a late removal work. Mr. Haye tells them of his observation, then Mr. Chéradame climbs on his motorbike to return home and moves away. He did go 100 meters on the road when his engine is blocked brutally and the motorcylcist falls on the road. The motorbike having undergone damages, he returns towards the farm of Mr. Haye to repair it. Mr. Marais lights the externallight then to light him. The two young people see at this time two forms high of 1,20 meter or 1,60 meter according to the counter-investigation by Joel Mesnard, and clad in a body that is brilliant in the light, or luminous white according to the counter-investigation by Joel Mesnard, the visibility being made precarious by a lashing rain. They advance in a slow and jerked way. René Marais hastens to go get his rifle, but his parents extinguished the lamp so that he did not see anything any more. At about 11 p.m., Mr. Chéradame departs again on his motorbike. He had hardly made a few tens of meters that he sees two sources of light which rise quickly in the sky. In the meadow, he notices that the herd of bovines is gathered, the animals turning like when they are disturbed by something unusual. The author adds that at the time of his counter-investigation in 1976, Joël Mesnard lengthily questioned Mr. Marais, at his home, and he confirmed his observation. He notes that sources indicates the 26th, other sources the 27th, as date, but Joel Mesnard established at the time of his counter-investigation that it was the 25th, because a birth in the family provided to Mr. Marais and his relatives a sure reference. The sources are indicated as : C. Garrreau and R. Lavier in "Face aux Extraterrestres", page 86; Michel Figuet and Jean-Louis Ruchon in "OVNI le premier dossier complet des rencontres rapprochées en France" pages 201 and 202; Lumières Dans La Nuit #299 page 33; Jean Sider in "Le dossier 1954 et l'Imposture rationaliste" pages 50-51; Journal de la Risle (Beaumont-le-Roger) for October 29, 1954. Farmer Gilbert Hee saw cows gathering about an elongated object with lights at both ends, resting in his pasture. 2 hours later an 18-year-old man fell from his motorcycle as it suddenly failed at the same spot; the object had moved only slightly. Hee and his neighbors saw the object & 2 occupants, who were about 3 ft tall, walked stiffly, and had clothes resembling bright armor. They vanished suddenly, and the craft took off without noise. Two 18-year old farm workers, Jean Cheradame & Rene Marais, encountered a bright light source on a field. As they approached the light, two featureless illuminated human forms emerged from the light source. They lacked both arms & legs, and essentially resembled “white plastic bags” lit from within. They emerged from the light source in the field and separated into two distinct forms as they approached; when they receded they again merged into one form before merging with the light source. They were about five feet tall. *Oct. 25, 1954 - At eleven o'clock at night in Jonquerets-de-Livet, Eure, France two 18-year-old farm workers, Jean Cheradame and Rene Marais, encountered a bright light source in a field. When they approached the light, two featureless illuminated humanoid forms emerged from the light source. They lacked both arms and legs, and essentially resembled "white plastic bags" lit from within. The figures emerged from the light source in the field and separated into two distinct forms as they approached. When they receded they again merged into one form before merging with the light source. They were about five feet tall. (Sources: David F. Webb & Ted Bloecher, HUMCAT: Catalogue of Humanoid Reports, case 1954-117, citing Joel Mesnard & Jean Marie Bigorne; Jean Sider, Dossier 1954 et l'Imposture Rationaliste, p. 220). *Oct. 27, 1954 - The close encounter experiences continued unabated during that evening. At 7:30 p.m. farmer Gilbert Hee, in Les-Jonquerets-de-Livet, France was gathering pears when he suddenly saw an elongated object with a light at both ends resting in the pasture. He didn't dare get closer to investigate, but he did see cows gathering around the object. A minute later, the lights on the object went out, and the witness lost interest and went home. Two hours later, an 18-year-old man named Cheradame fell from his motorcycle when it suddenly failed at the same spot, and alerted neighbors saw the object again. It had moved only slightly and two occupants were seen. They were short, about one meter tall, and walked in a stiff fashion. They had on clothes resembling bright armor. They vanished suddenly, and the craft took off without making a sound. At 8:30 p.m. a schoolboy and his school director saw a UFO on the ground in Moussey, France. Triangular ground traces were reported. At 11:15 p.m. in Oye-Plage, France on Route N40, the Mayor's secretary saw a bright, cigar-shaped object for 15 minutes. It was flying very low and following the turns of the road at 20 meters altitude. It suddenly turned at a right angle from the road and flew away. (Source: Jacques Vallee, Passport to Magonia: A Century of Landings, cases 317-319; David F. Webb & Ted Bloecher, HUMCAT: Catalogue of Humanoid Reports, case 1954-120, citing Vallee). This database recorded the case 9 times! A farmer, Gilbert Hee was gathering pears when he suddenly saw an elongated object with a light at both ends, resting in the pasture. He dared not investigate but saw cows gathering around it. A few minutes later, the lights went out, and Hee lost interest and went home. Two hours later, 18 year old Mr Cheradame fell from his motorcycle as it abruptly failed at the same spot, and altered neighbours, including Mr Marais, who saw the object again. It moved only slightly and two occupants were seen. They were about 1m tall, walked in a stiff fashion and had clothes like bright armour. They vanished suddenly as the craft took off without noise. Vallee Case 317 citing Carrouges 1963 p120. [pn1] Article in the regional newspaper Paris-Normandie, France, October 28, 1954. [---] Article in the local newspaper Journal de la Risle, Beaumont-le-Roger, France, October 29, 1954. 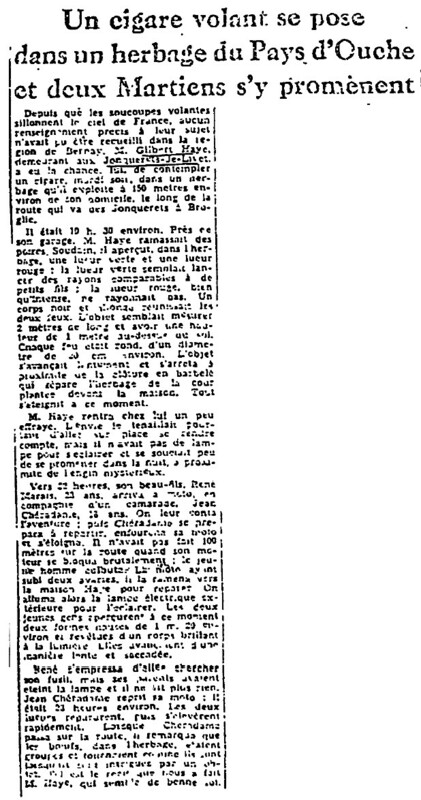 [---] Article in the national newspaper France-Soir, Paris, France, October 30, 1954, France. [lo1] "Flying Saucer Occupants", book by Coral and Jim Lorenzen, Signet Books publisher, USA, pp 98-99, 1967. [---] "Encounters with UFO Occupants", book by Coral Lorenzen, reprint of "Flying Saucer Occupants", Berkley Medallion publishers, USA, 1976. [---] "HUMCAT: Catalogue Of Humanoid Reports", case 1954-120, compiled by David F. Webb et Ted Bloecher, CUFOS, USA, circa 1977. [bb1] "La Grande Peur Martienne", book by Gerard Barthel and Jacques Brucker, Les Nouvelles Editions Rationalistes publishers, pp 57-58, 1979. [fr1] "OVNI, Premier Dossier Complet Des Rencontres Rapprochées En France", book by Michel Figuet and Jean Louis Ruchon, Alain Lefeuvre publisher, France, page 201, 1979. [bb1] "La Grande Peur Martienne", book by Gerard Barthel and Jacques Brucker, Les Nouvelles Editions Rationalistes publisher, France, pp 56-57, 1979. [---] "UFO Reports Involving Vehicle Interference" compiled by Mark Rodeghier, Center for UFO Studies (CUFOS), USA, 1981. [rc1] "Palmarès Des Observations Dans l'Eure", compiled by Robert Crépin, regional delegate for LDLN, in the ufology magazine Lumières dans la Nuit (LDLN), France, #259-260, page 39, January-February 1986. [sa1] "The 'Great Martian Scare'.. of two French ufologists who 'now think better' and have changed thei minds!+, article by Pier Luigi Sani, in the ufology magazine Flying Saucer Review (FSR), U-K., Volume 34, #3, 1989. [---] Ufology magazine Lumières Dans La Nuit (LDLN), France, #299, page 33, September / October 1989. [lg1] "The Fifth Horseman of the Apocalypse - UFOs: A History - 1954 October", monography by Loren E. Gross, USA, page 89, 1991. [re1] "Faces of the Visitors", book by Kevin Randle and Russ Estes, Fireside - Simon & Schuter publishers, USA, page 270, 1997. [---] Joël Mesnard and Jean Marie Bigorne, ufologists, France. [jg1] "RR3 - Le Dossier des Rencontres du Troisième Type en France", book by Julien Gonzalez, Le Temps Présent publishers, France, pp 157-158, 2014. 1.0 Patrick Gross December 21, 2009 Conversion from HTML to XHTML Strict. First formal version. Additions [lc1], [ud1], [ud2]. 1.1 Patrick Gross February 10, 2010 Additions [go1], [ud3]. 1.2 Patrick Gross October 26, 2011 Addition [lo1]. 1.3 Patrick Gross August 14, 2013 Addition [pr2]. 1.4 Patrick Gross September 28, 2014 Additions [sa1], [ni1], [ta1]. 1.5 Patrick Gross November 18, 2014 Addition [ni2]. 1.6 Patrick Gross December 12, 2016 Additions [pn1], [lg1], [jg1], [ub1]. Date changed from 27th to 25th. 1.7 Patrick Gross December 16, 2018 Additions [pr1], [lh1], [pr2]. 1.8 Patrick Gross January 12, 2019 Addition [re1]. This page was last updated on jauary 12, 2019.